The Commune and Arrondissement of Sedan in the Ardennes Department, and Champagne-Ardenne Region of France, is located only 10 kilometers from the Belgian border. Not too far from Arras. Note, that is a long way from Alençon and Argentan. But not so far from the lacemaking centers of Flanders. In an effort to stem the influx of foreign luxury goods, including lace into France, November 27, 1660 saw the issuance of the French edict “Déclaration contre le luxe des habits, carrosses, et ornements”. It didn’t work, and in 1661 it inspired the work “La Révolte des Passemens”, which is one of our chief original sources listing contemporary laces. Note that while Le Point d’Alençon is mentioned in the Révolte, there is nothing about Sedan. Someone that did actually help was Jean-Baptiste Colbert, the Minister of Finances under Louis XIV from 1665-1683. He worked diligently to improve the state of French manufacturers, and took steps to promote the lace industry in already established lacemaking centers. This is something that people who claim that Colbert established the French lace centers from nothing often fail to appreciate. On August 5, 1665 a Royal Proclamation was issued providing 37,000 livres to establish a government backed industry with exclusive trading privileges for 10 years. A selection process ensued to establish lacemaking centers – towns had to apply for registration within two years. It was originally intended that thirty expert workers from Venice and two hundred from Flanders would be enticed to move to the new centers, presumably by high salaries, although exactly how this was accomplished is unknown. The towns that seem to have made the cut were Quesnoy, Arras, Reims, Sedan, Chateau Thierry, Loudun, Alençon and Aurillac. The effort was not confined to needlelaces, bobbinlaces were also included. The collective name “Point de France” was applied to all the products of the nationalized industry. It was hard going getting the new industry established. Correspondence with Colbert indicates that of the ~8,000 workers in Alençon, only 700 were willing to work for the new company, to its standards and with new designs. Only 250 of these had the skill to imitate the best Venetian products. Workers in convents appeared to have ignored the government’s efforts completely. The ten-year duration of the company yielded a very good profit for investors, and the acceptance of standards and patterns does seem to eventually have had success. 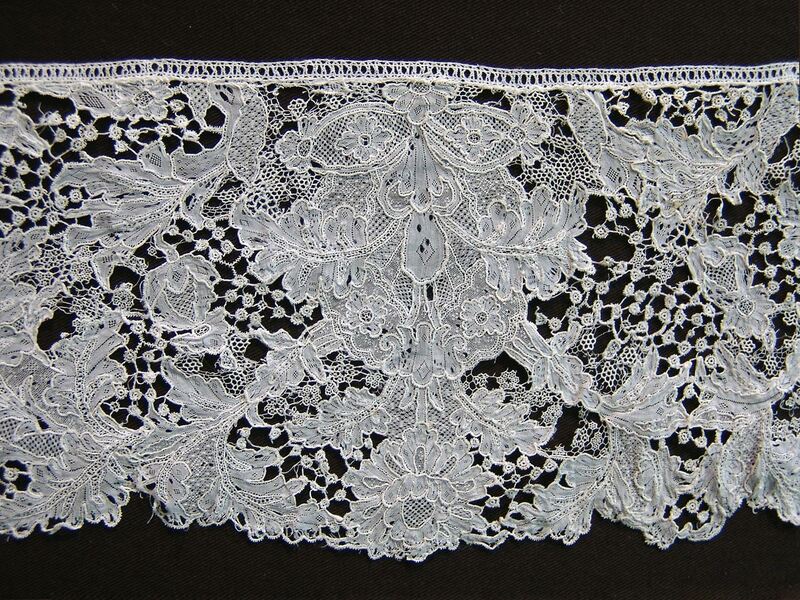 The name “Point de France’ survived, but for the needlelace products of Alençon only, in the highly symmetric small motif lace reminiscent of Italian Punto Nuevo. Needlelace in the 18th century was a continual competition between France and Flanders, with both producing some of the finest pieces ever made. I have chosen such an example as the June featured lace. This piece is in the form of a sleeve ruffle. Note the term”élegant” often used to describe this form seems to be a very modern invention and does not seem to be recognized much outside English speaking countries. This example is 41″ long, 4.5″ wide around the center, and has a symmetric mirror image design. It is made of some of the finest linen thread I have ever seen – some strands are formed of only about 4 flax fibers – still plied! The design is around 1725, with the innovative figures in the ground still some distance away from what we now recognize in Argentella lace. The style of the flowers is rather naturalistic, a trend away from the ‘bizzare silk’ patterns of the early 18th century. One could certainly wish it were in better condition, but this is a case where the technique far overwhelms the damage. So where exactly did this piece come from? Often such dense patterned fine needlelaces are given the name Sedan, without a lot of reasoning behind the choice. Palliser discusses the question, mentioning the opinions of several authors. Sedan itself was known for its cutworks well before the Royal edict – and it is unclear how the needlelace of the area developed. Some consider it a variation of Alençon, some a variation of contemporary Flemish flat needlelaces. By 1752 most authors agree that the Sedan lace quality had fallen to be of little value, and by the revolution, the entire industry had vanished. Séguin states that the Sedan lace is inferior to Point de Venise à Réseau, although who knows what he means by that? The Venetian flat needlelaces were vastly inferior to contemporary Belgian examples, and at this time both were known as Point de Venise à Réseau. That misnomer applied to the magnificent early 18th century Belgian flat needlelace is still in evidence today. 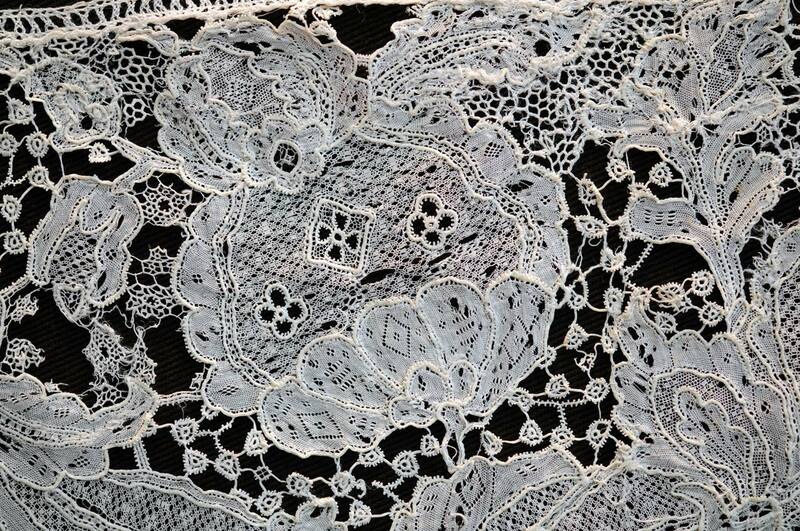 Lefébure considers Sedan lace as a variant of Alençon, and it seems to me that the pattern of this piece bears a lot of similarity to later Alençon floral designs. Others think it was a Belgian product of Brabant or even Liège. And the attribution of Sedan also seems to apply to several cities in the Champagne area. Most authors agree that the proximity to Flanders made extraordinarly fine thread available to the lacemakers, both in size and whiteness. One piece bearing the Sedan label is in the Musée des Tissues in Lyon, and can be seen as on page 171 of Bruggeman’s “L’Europe de la Dentelle”. Aside from the regular bride mesh ground, it isn’t too far from this month’s piece. I don’t know if there is some provenance justifying the Lyon nomenclature. This entry was posted in About the featured lace. Bookmark the permalink. Thrilled to read your intelligent writing on a favorite subject.